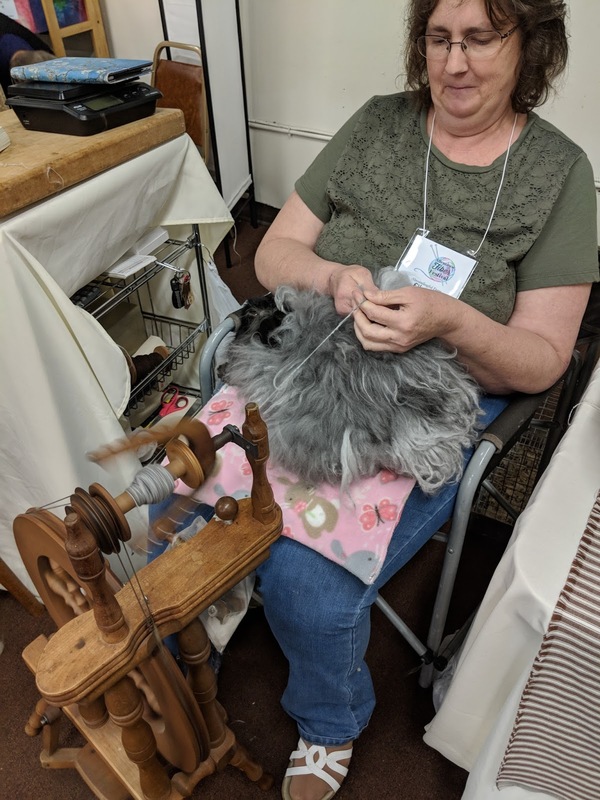 The Threaded Lane: Fiber Festival!! I guess I could have titled this post "Dee Is No Longer a Virgin" - LOL. Yesterday Dee and I met up in Allentown for the Allentown Fiber Festival - Dee's first festival. I'm sure you've already read her blog and have seen that she did ok - picking up some lovely yarn and a nice pair of underwear...I mean a beautiful flamingo project bag. It was a beautiful day for the festival - sunny and, if you can believe it, 82 degrees!! So sweet and so very, very soft. His/her (not sure which) owner was holding another rabbit in her lap and spinning right from the rabbit!! It was fun to watch. We saw a couple of rabbits for sale, but I didn't think Tyg would take kindly to my bringing a rabbit home...or he might, but the rabbit wouldn't last very long. So here's a look at what I got. 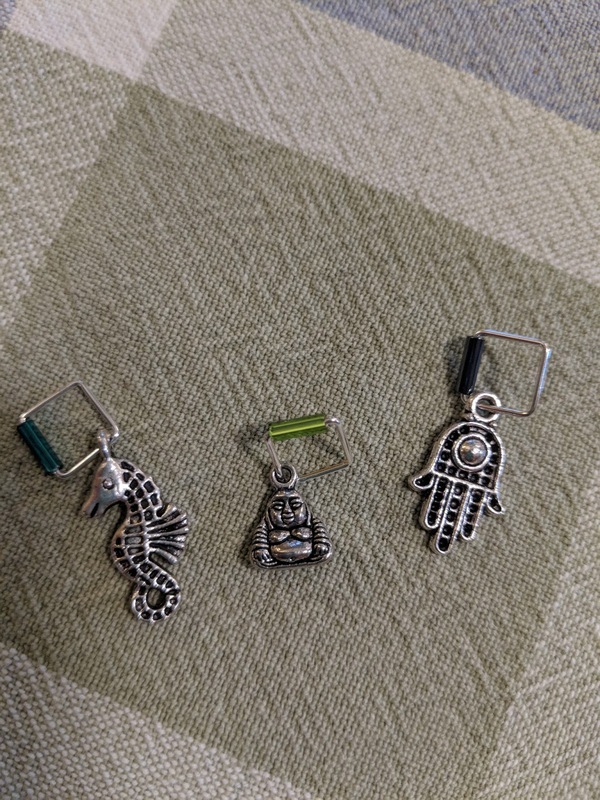 First up stitch markers. I love buying individual ones - fun and cheap! Aren't they cute? I love them all. Both sock weight yarns, of course. The green is Kettle Steps, Good for Ewe. It is 40% superwash merino, 40% baby llama and 20% nylon. 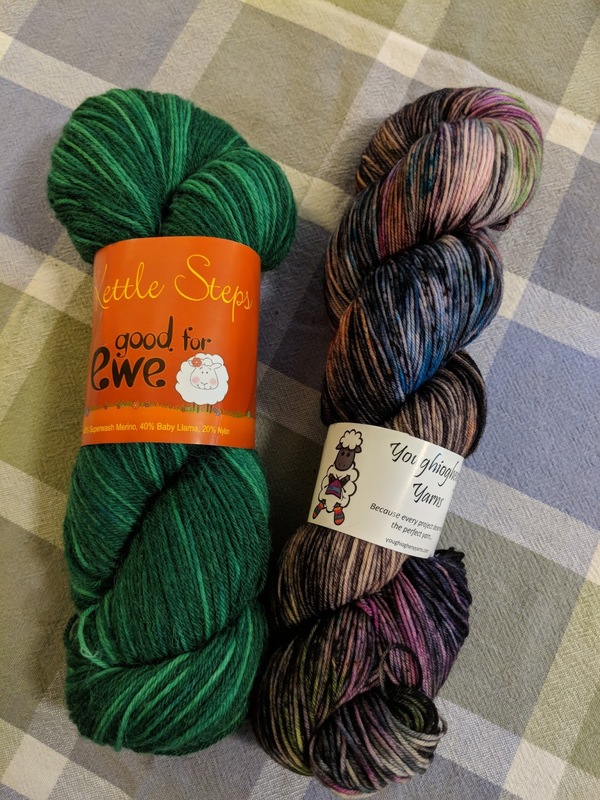 The skein on the right is from Youghiogheny Yarns and is their "show color." Limited quantities are dyed for the festival. One of the women in the booth was knitting some socks with it and they were gorgeous. I had to have it!! It is 75% merino and 25% nylon. 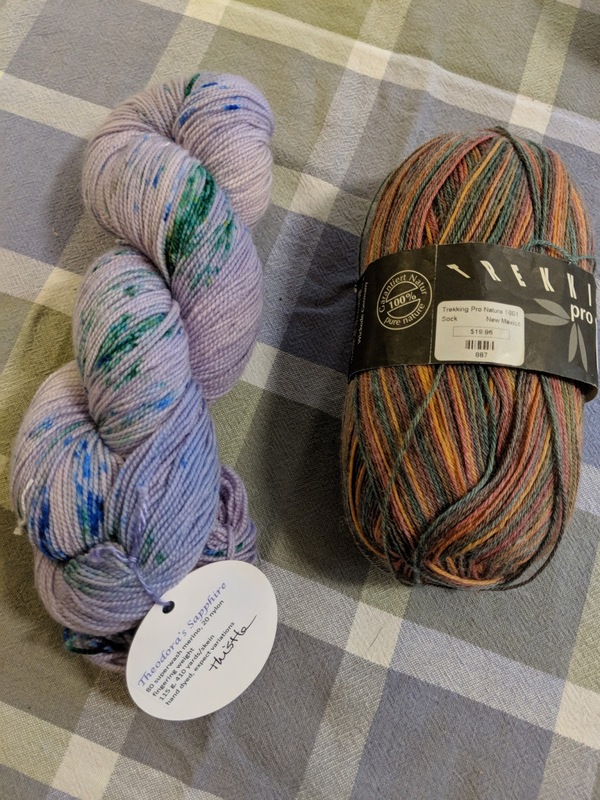 The skein on the left is a new one to me: Theodora's Pearls by DizzyLettuce and the colorway is Thistle. It is 80% superwash merino and 20% nylon. The skein on the right is Trekking which I've been wanting to try (75% superwash and 25% bamboo). And that's it! I saw plenty more that I wanted to buy but was trying to be reasonable. After shopping we stepped across the street for burgers (the BEST burger I've had in a long time) and then Dee and I ended up at a coffee shop across the way (actually a combination coffee shop/bike shop - Kathy I was thinking of Fireman!!). When I finally decided I really needed to get home, I pulled up Google maps and was directed home via back country roads. It was a beautiful drive and actually faster than the ride up on the turnpike had been. Today, of course, is a different story. Rain, grey and chilly - about 40 degrees cooler than yesterday! At least we are not having snow (which some of you are...I'm so sorry). Time to wrap this up and get ready for bed! Hope everyone had a wonderful weekend! I think we did pretty good at the festival!!! We got lots of nice stuff but didn't break the bank. Of course, now I'm on the search for flamingo bloomers! That's a rabbit on her lap? LOL!! I love the little festivals the best! You can take your time and talk to vendors without getting elbowed out of the way. I'm so glad you had a wonderful time at the festival! The new yarns will be showing up here in no time! Exciting to see the Redbud tree wake up! That show yarn--I'd probably have gone for it, too, but would have definitely yearned more for the bunnies. You're so fortunate to have a nice, healthy redbud! Something has gotten to almost all the redbuds around here and slowly killed them off. It's terribly sad. Enjoy yours. Looks and sounds like a wonderful time! And I think you showed admirable restraint in your purchases. They are really nice choices, can't wait to see any projects you make with them. Spinning directly from the rabbit - interesting! I'm so glad you and Dee had such a good time! I love that Kettle Steps color; really, it's all lovely and I look forward to seeing your projects with all that great yarn when you start knitting. What a wonderful recap of a very fun day! 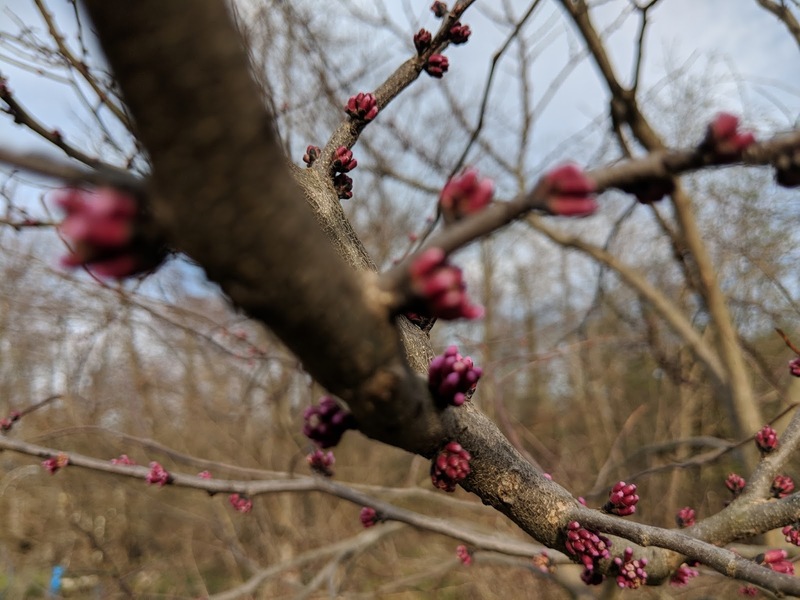 ...and here's to the return of spring so your red bud blooms! The SHOW color skein is really so lovely. 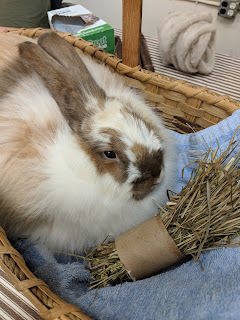 I'm thrilled you showed the spinning right off the bunny. I am always amazed by that! Small shows are the best, I think. Thank you for thinking of me and FIREMAN! It sounds like you had a fabulous time at the festival. I really enjoy the smaller fiber festivals much more than the big ones. (Rhinebeck nearly did me in! So much . . . people-ing!!!) It looks like you found some great yarn and stitch markers. What FUN. It sounds like you had a wonderful day with Dee. I am a bit jealous of your purchases, although I am still on a yarn diet so I am trying to be good. I think your VaCa began on this day! What a delightful adventure and yarn and memories to savor. Thanks for sharing and so delighted Mother Nature was kind for your outing. Sounds like a very fun way to spend a day! Looks like you found some nice things. Love the markers!